72 May 3 1879 The Denison Total Abstinence Union met persuant to adjournment. The secretary was absent. The meeting opening with music and prayer by Rev. J. B. Hawk. 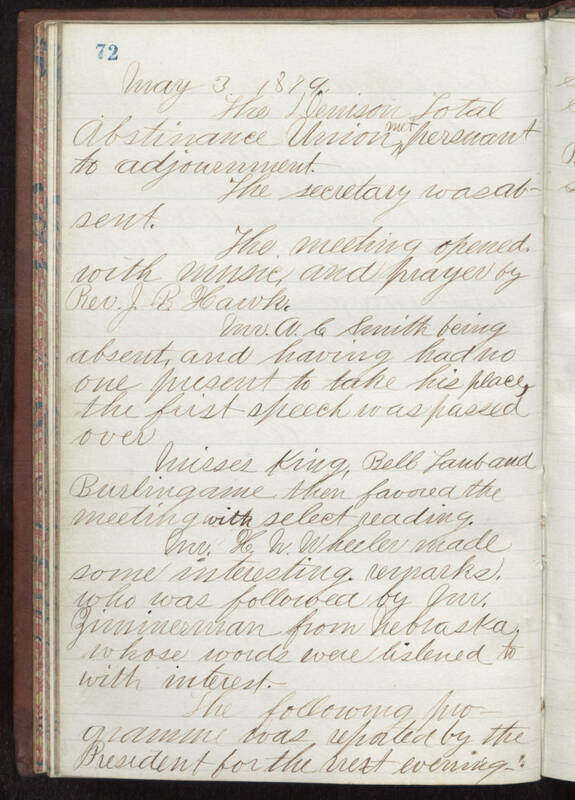 Mr. A. C. Smith being absent and having had no one present to take his place, the first speech was passed over Misses King, Bell Lamb and Burlingame then favored the meeting with select reading. Mr. H. W. Wheeler made some interested remarks. who was followed by Mr. [Ziminerman?] from Nebraska whose words were listened to with interest. The following programme was reported by the President for the next evening.